Pictures: Christian G.E.Schiller with winemaker/owner Tony Kooyumjian (Montelle Winery and Augusta Winery) in Missouri. Wine producer Missouri? When I told my friends that I was going to St. Louis for a wine conference on locally produced wine, they were very surprised because they had been under the impression that wine is produced in California, Oregon and Washington State, but not in the Mid-west in Missouri. They are wrong. DrinkLocalWine.com – which is about is about spotlighting wine made in the 47 States of the US that are not one of the big three: California, Washington State, and Oregon - held its third annual conference on April 1-3, 2011, in St. Louis, Missouri, and I was very happy to be able to participate in it. I have provided an overview about the Drink Local Wine Conference 2011 in Missouri here. One of the highlights of the conference was the DLW 2011 Missouri Twitter Taste-off; 20 wineries participated with 2 wines each. See here. Missouri became part of the US under President Jefferson in the context of the so-called Louisiana Purchase, whereby the US acquired 828,800 square miles of land from France in 1803. The Louisiana Purchase encompassed all or part of 14 current US States from Louisiana in the South to two Canadian provinces in the North (about ¼ of the current US territory), doubling the size of the US in 1803. 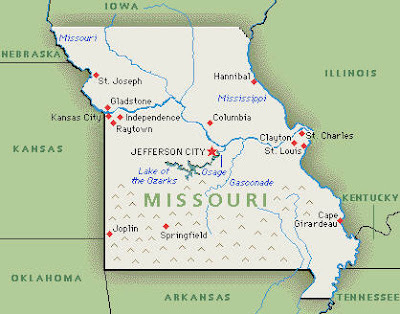 Although today Missouri is usually considered part of the Mid-west, historically Missouri was considered by many to be a Southern State. The first European settlers were ethnic French from Canada, who created their first settlement in Missouri at present-day Ste. Genevieve. St. Louis, about an hour north of Ste. Genevieve, was founded soon after by ethnic French from New Orleans. St. Louis became the center of a regional fur trade with Native American tribes. Traders shipped their furs from St. Louis by river down to New Orleans for export to Europe. St. Louis expanded greatly after the invention of the steamboat and the increased river trade. As many of the early settlers in Missouri migrated from the South, they brought enslaved African Americans for labor, and a desire to continue the institution of slavery. At the same time, from the 1830s to the 1860s Missouri's population almost doubled with every decade and the newcomers were Irish and German immigrants, not sympathetic to slavery. The result of this was many years of struggle between Union and Confederation supporters, in which the Union forces prevailed. Missouri’s wine history dates to the 1830s, when German immigrants established Hermann and the Missouri River as one of the main viticulture areas in the US, growing the American grapes that they found there when they arrived. Wineries like Stone Hill, in Hermann, and Mount Pleasant, in Augusta, were pioneers. 50 years later, more wine was produced in Missouri than in any other State in the US. In the 1880s, Stone Hill Winery in Hermann was the second largest winery in the US and the third largest in the world. Its wines won awards at the world fairs in Vienna in 1873 and Philadelphia in 1876. But then came Prohibition and brought Missouri’s wine industry to a halt. However, Missouri’s wine industry came back, starting in the 1960s, in particular after French American hybrid grapes became available. Indeed, the Augusta AVA (American Viticultural Area, the American equivalent of the French Appellation d’Origine Contrôlée - AOC) in Missouri is the first federally approved AVA (gaining the status on June 20, 1980, eight months before the Napa Valley AVA). Today, Missouri has more than 1,400 acres planted in grapes and more than 100 wineries. Missouri is again a serious wine producer, relying heavily on French American hybrid grapes and native American grapes like Vidal Blanc, Seyval Blanc, and Norton - the latter one being the most prominent Missouri-grown variety. The State’s climate is harsh and humid and vinifera grapes – like Chardonnay and Merlot - have a hard time to thrive under these conditions, although recently there has been more interest in planting vinifera grape varieties. However, overall, Missouri is a small player now, accounting for less than 0.5% of total wine production in the US. When the German settlers arrived in Missouri in the 1800s and started to grow wine, they did this with the native American grapes varieties they found in Missouri. So, before prohibition, when Missouri was a dominant wine producer in the US, Missouri produced its wine with American grapes, like Concord. Then came the phylloxera crisis in Europe and biologists fought to rescue European winemaking. One route they went was crossing the European grapes with American grapes. They developed what is now called French American hybrid grapes. These try to combine the elegance of the European grapes with the robustness of the American grapes. Eventually, Europe went the way of grafting European grape vines on American rootstocks, which solved its problem, but at the same time these French American hybrid grapes came into existence. Missouri is taking advantage of them. Revival of the state's wine industry started in 1965 with the reopening of Stone Hill Winery in Hermann, followed by the opening of Mount Pleasant Winery in Augusta on the north side of the river. Seyval Blanc – One of the first French American hybrid grapes; is popular in England and the Finger Lakes region. “When I started to grow Seyval Blanc, 80% of the wines were fermented in a sweet style at my winery; now it is the opposite” said winemaker/owner Tony Kooyumjian of Montelle Winery and Augusta Winery. Chardonel - Is a late ripening white wine hybrid grape, developed in New York State as a crossing of Seyval Blanc and Chardonnay. Traminette - Developed by Cornell University; Gewürztraminer is one of its parents; a rather new grape variety. Vignoles – Popular in the Finger Lakes region and along the Missouri River; another very aromatic grape variety. "Lends itself well to a slightly sweet wine.” said Tony Kooyumjian. Marechal Foch – Developed by the Alsatian Eugene Kuhlmann in France. Norton remains the most prominent Missouri-grown grape variety, Missouri’s signature grape. It is also known under the name Cynthiana and believed to be a variety of vitis aestivalis. Among the two dozen or so grape species native to North America, only one has proven itself capable of good dry table wines - Norton. “American grape varities are good for sweet wine but they are not good for dry wines” said Tony Kooyumjian. Norton is also very popular in Virginia and I have written about it here. Recently, there has been a renewed interest in vinifera (European) grape varieties in Missouri and I indeed tasted some. But often the Merlots and Chardonnays made by Missouri wineries are wines made with fruit brought in from California, i.e., wines made from grapes grown in California and fermented and aged in Missouri. Such wines are identified as American wines on the back label, as opposed to Missouri wines or even more restrictive appellations. But advances in vine growing have furthered the prospects of planting vinifera grapes in Missouri. Augusta AVA: The first AVA in the United States. In the mid-1800s German immigrants found the Missouri River area just west of St. Louis to be well suited for growing grapes. Ozark Mountain AVA: A large AVA with several smaller AVAs within its borders, including Augusta, Hermann and Ozark Highlands. It is the sixth largest AVA in the US. Hermann AVA: One of the most historic wine regions in the US. Ozark Highlands AVA: The fourth accorded AVA in Missouri. If wines are labeled Missouri Table Wine, then they come from more than one Missouri AVA. Finally, you can also find wines in Missouri that are labeled as American Wines. These are wines made with grapes coming from out of state. Finally, one should not forget that under the AVA regulations, only at least 85% of the wines has to originate there and up to 15% can sourced from elsewhere.